Indian driver Karun Chandhok has been announced as a race driver for the HRT Formula One Team, ahead of its livery and team launch on Thursday. HRT was confirmed on the FIA's official entry list on Wednesday, but its management waited until Thursday before confirming Chandhok as a driver. Chandhok has raced in GP2 for the past three years, where his best overall finish was tenth. He will join fellow rookie and ex-GP2 team-mate Bruno Senna at the Murcia-based outfit, which will turn up at the first race in Bahrain with an untested Dallara-built car and Cosworth engine. "I am very pleased to use the Murcia site to officially unveil our car livery today," said team principal Colin Kolles. "We also complete the driver's team line-up with the Indian Karun Chandhok at the wheel of the car for our first ever season. "We have been very impressed with Karun's performance in GP2. India is a great country. 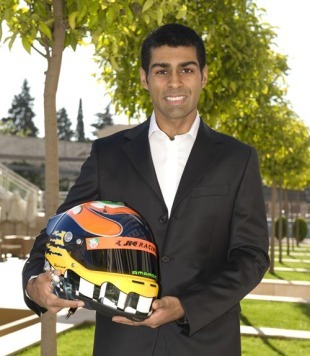 It will be great for the sport to have an Indian driver on the grid for the first Indian Grand Prix [scheduled for 2011]. Everything is now in place after an impossible race against time to register the team's name and I truly believe that we have an excellent platform to build on and move forward for a strong 2010 performance. Now we need to work together. We need to learn together and keep developing as a team." HRT's owner and chairman Jose Ramon Carabante outlined the reasons behind the new team name, which was officially changed from Campos Meta1 this week. "The name of the team contains the word Hispania, which is not only the name of one of my companies, but Hispania was also the Roman name for the Iberian Peninsula. That reflects our team's new identity. 2010 will be a major debut for the team and drivers at the wheel of our HRT F1 Team car."